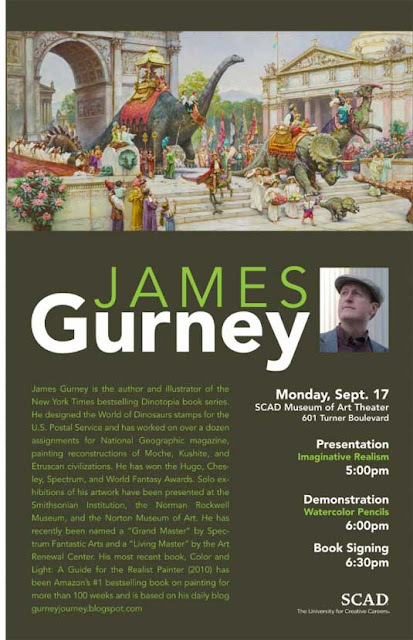 Looking forward to spending a full day tomorrow at the Savannah College of Art and Design (SCAD Savannah). Here's more. Hi James, love the blog and all the advice! When you are down in SAV you have to go to Zunzis, trust me. If you have time to do any watercolor sketches please post them I'd love to see your rendition of Savannah, also I have questions on pushing value range in wc! I'm in Atlanta, and I see that both your blog and website have your appearance at SCAD Atlanta listed. However, I'm unable to find any information on it whatsoever on SCAD's own website. Am I looking in the wrong places, or has the Atlanta SCAD appearance changed/moved? If it's still on, will it be open to the public by any chance? Thanks very much.